LXer: Update to "How long is a piece of string?" Update to "How Long is a Piece of String ?" I must admit that I had not thought of this update until recently. 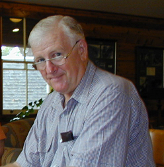 To "put the blame where it belongs" (with a wry smile), it was Bob who triggered the whole deal by asking me about internal currents in a series-parallel storage battery system such as our home uses. It didn't take much self persuasion to consider writing some additional text which might "fill in a few holes" in the original article. Thanks Bob, it's been an enjoyable exercise. It is now a little over three years since I wrote the original of the article which is included below. In all that time, nothing has been altered with respect to any of the major components of the stand-alone, solar electrical system that provides electrical power to our home. It continues to supply excellent 240volt, 50Hz power to our home. The quality of the various components is extremely good in our opinion, and we remain very satisfied with its operation. Nevertheless, some aspects have altered within the house and there are some other characteristics of the system that were not fully explored in the original article. The purpose of this short update is to explain those alterations (and how they have affected household power use) and also to expand upon some other aspects of maintaining the system as a whole. I hope these notes will prove useful to some LXer readers. Ridcully. LED technology and Power Reductions The advances in LED technology have allowed some alterations. The first item to be replaced was the LCD television set which normally consumed approximately 90 watts when running. This was replaced with an LED television set with a much larger screen (80cm diagonal, approx. 31") than that of the LCD television set. Power consumption immediately dropped to about 30-35 watts and since live to air television and dvd films are a major source of entertainment for us, the saving of power was considerable. I might also add that the quality of the display in this later equipment is also superior. Over the past year, LED light bulbs have made their way onto the Australian market. While they are currently a little more expensive than the electronic fluorobulbs that were used as lighting throughout the house, the advantages in power saving were again too great to be resisted. As a comparison, the original incandescent bulb used in house lighting consumed 100watts. The equivalent fluorobulb for light output consumes 25watts. There is at present, no widely available exact "100watt equivalent" for LED bulbs, but I am assured that they are on the way. However an LED bulb which is equivalent to the original 80watt incandescent bulb is certainly available and the power consumption lies between 10-12 watts. Where practicable, LED bulbs of varying wattages have now replaced all fluorobulbs in the house and again the power drops in consumption are very noticeable. As an example, bedside lights which normally used fluorobulbs of about 15 watts have been replaced with LED bulbs drawing only 5-6 watts. The results have been extremely good. Previously, an aspect of our home was that at night, lights were turned off when rooms were vacated. That is still a "rule of thumb" especially in cloudy weather, however if there is a period of several days of full sunshine, so much power is generated that lights in the living rooms and kitchen remain on permanently in an attempt to actually consume some of the excess stored energy. That is quite a change in domestic power usage. My general conclusions are simply that where possible, a home using a stand-alone solar power system will benefit considerably by employing LED based components wherever possible. NBN For those not up with Australian jargon, "NBN" is short for "National Broadband Network". This short item is not concerned with any of the political aspects of the Australian NBN, especially its costs, advantages and speeds; it simply explains what happened and our results. About 12 months ago, our home was, at that time, connected to the Australian internet via a copper landline which had been laid when the house was built in 1984. The line had been hit several times by lightning (violent storms are prevalent in our area) and its operation was defective/faulty at the best of times. Dropouts were frequent and it was a superb day on which a download speed of 800Kbits/sec was achieved. Upload speeds of perhaps 200Kbits/sec were simply what you got and put up with. Telstra (the landline operator) knew the line was defective but was extremely reluctant to do anything about it. As I saw it personally, their policy was to: minimise cost, leave even faulty lines alone if they were at least partially working, and muddle along while waiting to get as many users as possible over onto the NBN system when and if that finally arrived. We tried to keep telephone costs (most of our calls are long distance) down by utilising a VoIP Billion modem and this did indeed assist in cost reduction, although I have written elsewhere of the incredible problems that particular system created at odd times. It was therefore with delight that I discovered that our area was to be one of the first sites in our region to move over to NBN. It won't surprise anyone that I was in the Telstra centre in Kingaroy within a couple of days and found that I was the first person in the Blackbutt area to apply to be placed on the NBN. Since I was the first, the assistant had no idea as to the forms etc. that had to be completed and what now takes about 20 minutes stretched into about 1-2 hours...LOL.....but we got there. As a result of that application, both the NBN operators and Telstra arrived during November 2014 and the house was fitted with a wifi connection to the NBN tower and a Telstra VoIP modem specifically designed to run through the NBN and preserve our Telstra connnections. At last the old copper line was disconnected and discarded....May it rust in peace. Power consumption of the NBN box and the Telstra modem is minimal. I think it is under 6watts in total, but the reliability of the system for both internet and telephone calls is exceptionally good. Since a reliable and consistent internet connection is essential for my work, the change has been excellent. Download speeds are now about 45Mbits/sec and upload speeds are about 24Mbits/sec. While strictly speaking this transfer to the NBN has little to do with the solar electrical system apart from its minimal power consumption, the vast improvement in reliability of the internet connection is a bonus that is worth mentioning and of course, it allows me excellent access to LXer for my editorial work. Circulating Currents As described in the original article, our storage battery bank consists of 8 x 6 volt, 200amphour, deep cycle, lead-acid batteries in a series-parallel setup such that there are two series of cells producing 24 volts which are connected in parallel. That remains the case and I see no reason for altering the situation, given our power requirements. During some discussions we had, Bob brought to my attention an aspect of this setup that could cause problems, namely the possibility of internal currents that could discharge the batteries and render them inoperable. To begin with, I shall state again that it is always best to only employ a single bank of series connected cells, however in the past, the economics and practicality of the situation drove our ultimate decisions. When first put into operation, our system was only running a 450Watt maximum power, square wave inverter. We had also decided to opt for a 24volt battery bank rather than a 12 volt one, as the higher voltage halves the battery load currents and places less strain on the batteries. Therefore, our first battery bank about 30 years ago, was two 12 volt deep cycle batteries in series. If you contrast the costs in today's terms, that is about $450 for the two 12 volt batteries and over $1600 for four 6 volt batteries. There was no contest. As a result, we have always avoided using the very large capacity 6 volt batteries. Theoretically, our series-parallel battery bank has a total capacity of 9.6 Kilowatt Hours. This is ample for our general use and even three successive cloudy days will still leave the system at perhaps 30-40 % storage. To obtain the same storage capacity using only a single bank of 6 volt cells would require each battery to have a capacity of 400 amp hours. Currently, a single 6 volt, deep cycle battery with a capacity of about 450 amp hours is approximately A$650 and therefore an outlay of $2600. The comparison is about $2200 for 8 x 200 amp hour batteries and their smaller size makes them much easier to move and transport – especially if only one person is doing the job. However, to be frank, it's really up to the individual and how much cost is considered reasonable. In a single series battery bank, if a cell drops its internal voltage due to some physical fault, there is no effect other than a drop in the overall voltage output. However in a series parallel installation, the same situation will mean that the parallel bank of four correctly functioning batteries will “see” a lower voltage than their own across the other parallel bank of four cells which contain the defective cell. The good bank therefore “sees” a load through which it can discharge a current and so an internal discharge current will be set up which can markedly lower the battery bank capacity and even lead to insufficient overall voltage supplied to the inverter powering the home. At this point in time, I should like to state that such a situation has certainly not occurred in the past 5-8 years of our present set of batteries. I have become uncertain as to how long the present battery bank has been in use, but it is certainly over 5 years and could even be approaching 8. At one stage I was informed that the life span of a lead-acid deep cycle battery was about 8 years, but extensive reading has now suggested that these batteries can “soldier on” for much longer periods and can even be fully operational for as long as 12 or more years. Provided the user is careful about monitoring the battery bank for cleanliness and checking electrolyte levels etc., the possibility of these internal circulating currents is minimised. It has to be said though, that once a cell in an aging installation fails, there is very little option other than to replace the entire bank. It is extremely bad to put a new cell in amongst much older cells. The older cells have a reduced amphour capacity and will rapidly affect the new cell and bring it down to their poorer quality. Far better to replace the lot. Cleanliness At first (going back 25 years) our battery bank of four 6 volt, 200 amp hour cells was simply placed on a raised wooden platform and left exposed to the air under a work bench. This is just about the worst thing you can possibly do to the storage system. Dust accumulates on the battery surfaces and moisture condenses on the terminals. The result is accelerated corrosion and of course some leakage across the battery surfaces. Curiously, certain types of small flies appear to “love” the acidic conditions of the batteries and begin to infest the area, and again cause corrosion. The only acceptable solution is to build a battery enclosure. Ours was built professionally and is a large chipboard box with a lid that firmly shuts out all dust and moisture. It is ventilated by screened outlets (essential because the gas produced by venting batteries is explosive hydrogen) and all cable entrance/exit points are sealed. It's with pleasure I can report that since that professionally made box was installed, terminal corrosion has ceased totally, dust is absent and the only job I now have is to check electrolyte levels about once every two months. And here's a practical tip. Despite all the care in the world, you WILL spill some distilled water on the battery surfaces when you are bringing electrolyte levels back to normal. I used to use a soft cloth, but I found this very unsatisfactory......you could never quite get all the moisture off the battery surface. The answer was paper tissues. They are excellent and disposable. Equalisation This is an unusual but interesting aspect of the battery maintenance. The PL40 controlling module, not only controls the currents flowing into the batteries from the solar panels, it also runs through a sequence of types of charging situation which include such things as boost, charge, float, absorption and equalisation. Pre-set values of voltage and current are contained in its memory and as a simple example, when (on a sunny, clear day) the battery bank voltage reaches 29.8 volts, the controller recognises that the batteries are now fully charged and switches into float mode. At the same time the charging current will drop enormously from perhaps a little over 20 amps down to about 5 or 6 amps, so that the battery bank is now in “maintenance charge mode”. Where the batteries are new, no problem. Where the batteries are older however, the passage of time means that some of the lead compounds on the battery plates become insoluble lead oxide and this collects on the floor of battery. The “boiling” tends to disturb this bottom layer and strong equalisation results in quantities of the bottom layer being distributed throughout the acid electrolyte which becomes cloudy........Not good. My solution, which is possibly wrong to the purists but which does seem to be working successfully so far, is to use the internal monitor in my study because it can tell me which mode the PL40 has currently reached. On the infrequent occasions it does set itself to “equalisation”, I immediately switch it on to the next charging mode. In this way, the bottom layer is left undisturbed. Certainly, some of these old cells may not be as fully charged as they might be, but I don't want to disturb them while I can continue to obtain usage from them. And there we are. I hope the above has been of use. Technology is of course, galloping onwards and some deep cycle batteries now on the market are completely sealed and therefore never need maintenance to keep the electrolyte levels correct. I have neither used nor investigated these cells, but perhaps it might be worth a look. When people learn that your home runs on electricity produced by solar power, one of the many questions that soon comes up is: “It seems marvellous to be so independent. How much would it cost for me to move over to solar power?” And my answer is invariably: “Without wishing to give any offence, but to indicate how difficult it is to answer that question, let me ask you instead: How long is a piece of string?” My next move, if the questioner wishes, is to plunge happily into a deep discussion and help them understand why any answer to their quite serious question is so difficult to provide. 2 What devices do you want to power? 3. How much power storage do you want? 4. What is the largest device you wish to run in terms of power consumption? 5. How much will be your baseline load? 6. Will your house run on AC or DC? 7. How do you intend to service the needs of hot water, cooking, heating and refrigeration? 8. What are your reasons for doing this? I hope to show that our particular installation has satisfied all the above points. 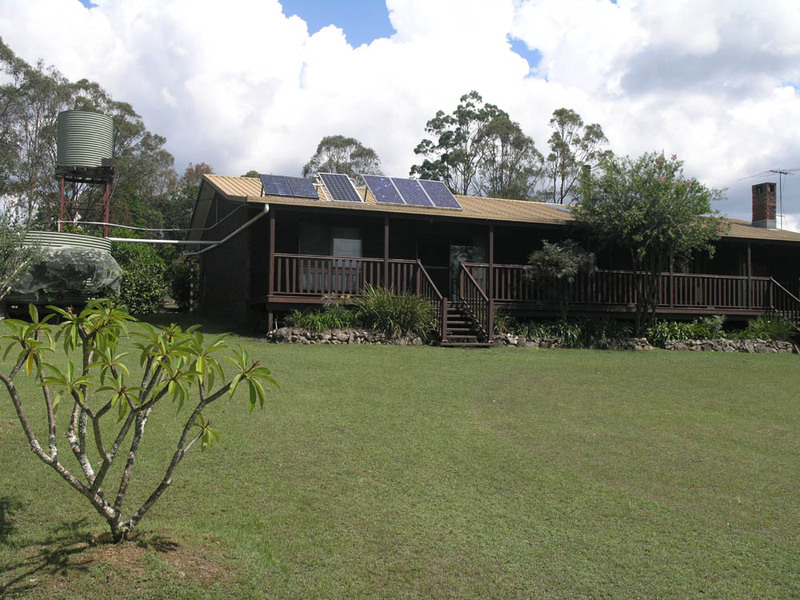 At the end of 1983 our family moved to Blackbutt, a small country town in south-east Queensland about 160km north west of the state capital of Brisbane. Blackbutt was much smaller then and we owned a 2.5 hectare block of bushland about 3km out of town. We set about constructing a new home and two things soon emerged: the need for both a telephone line and mains power. We applied for a new phone line and Telecom (as it was then) was already laying the new line before the house was completed. It cost us nothing to get the line installed. A main power line was the next item. We approached the local power company office in Kingaroy and asked the staff officer about the cost of getting a power line connected to our block. Our new home lay on a side road 1km from a larger road along which a power line already existed, so a branch line could readily be put in place. To our horror, the sum quoted to get a power line onto our home was $19,000 and in terms of today's prices probably somewhere between 2 and 3 times that. We were also told that: the line would not be in place for about 24 months; the money was to be paid immediately; and best of all even when we did get connected, the quarterly power bill would be set at a minimum amount which assumed a power consumption that would be more or less triple the amount we would actually use. The officer was also quite rude and exceptionally unpleasant so we walked out of that office with a combined mind set that was “not very friendly towards main power companies”. Our new home had been designed with alternative energy sources in mind. The plans included an open fireplace, a slow combustion stove to give both hot water and heat for cooking and a gas fired refrigerator. We began to realize that our style of home could not justify the enormous cost of main power connection, given the low amount of power we would consume because it would not include the biggest items that use power: hot water, cooking and winter heating. It was at this moment that our discussions finally turned towards solar electrical power because it was obvious even then, that it would be far less in cost, would give us independence from the mains, and we would have it almost immediately on house completion not two years into the future. We then made the next big decision: our home would run on the Australian standard of 240 volts AC. This meant that our house wiring would also be standard rather than the special wiring required for heavy currents and low voltages used by DC installations. It also meant that our existing electrical appliances could be used and additional appliances in the future would be “shop standard items”. Although this necessitates the additional component of an inverter and a small loss of power used in the inverter itself, the convenience of a normal voltage home is enormous. A little more thought showed that our solar electrical system would be required to run things like room lighting, mixmaster, sewing machine, video-player, television set, sound system and a computer. Given those appliances, it was unlikely that the maximum power usage per a device would be more than 200 watts; we also accepted that not all of these things could be run at once and we would have to be careful with our energy usage. Our research found that we could outfit our home with a small solar electrical system for about 5-6 thousand dollars that would provide us with 4x35 watt solar panels giving a total of 140 watts of power generation. With a charging current controller (which would ensure that the battery bank was not overcharged) 4x12 volt deep cycle batteries, a square wave inverter with a maximum continuous power output of 450 watts along with the relevant panel supports and wiring. We chose to use a 24 volt battery system because this halves the current flow present in a 12 volt system. We had the first installation done by a professional firm and since I had taught electronics in the Navy, I was able to understand the simplicity of a typical, small stand-alone system. To provide the power necessary for a washing machine and iron, we also purchased a small 3 kilowatt petrol generator which could be plugged into the system together with a battery charger so that surplus power could be transferred to the batteries. As we remarked, the lower cost of the system meant that we would have to consume roughly $12,000 worth of petrol to cover the total cost of mains installation. In the initial stages there were some basic problems. Square wave inverters were normal at that time, but they are somewhat inefficient and electrically noisy. They produce an electrical “buzz” as a result of square wave harmonics, and this made normal radio reception almost impossible, but curiously TV was unaffected. Square wave power is also more prone to producing higher temperatures in appliances driven by the inverter. In these early years, the biggest annoyance was the lighting. Fluorescent bulbs had just arrived and their lower power consumption made them a necessity, however they were the original enormous bulbs that ran on the same principles as the strip fluorescent lights with their flickering starters......If you turned on a device at night, all the house lights would flicker until they re-established their load current and it almost drove us insane. Thankfully it was not long afterwards that the first electronic bulbs came onto the market and the flickering ceased. A ceiling light in one of our rooms still uses one of those first electronic bulbs and still works superbly after 25 years. The intervening years between roughly 1986 and 2012 have not changed our basic principles of power generation design although the system itself has been upgraded (mostly by myself, once professionally) so that it is now far more robust and able to supply much larger loads and provide simultaneous power to a larger number of appliances. Our system is also as large as it can be without resorting to the much more expensive solar systems that have sufficient panels and storage capacity to run all aspects of the house. The first photograph (Fig. 1) shows our home as it is currently in February 2012. The original 4x35 watt panels have long gone and been replaced by a series of higher powered panels. Starting from the left hand side, there are two 12 volt panels connected in series to give about 100 watts at 24 volts. The remaining 4 panels are 24 volt panels: the single middle panel produces 180 watts while the other three produce 160 watts each. This gives a total system possible output of about 760 watts under ideal conditions during the middle of the day. A heavy current cable connects the panels to the power shed which is not shown in this photograph, but which is behind and to the left of the main water tank. House view showing the solar electrical panels on the roof. The house faces NNW almost perfectly so that a permanent installation is relatively easy to align for maximum power output. To control the currents from the panels to the batteries, a PL40 controller is installed. This can control currents up to 40 amps, but in practice the panel charge currents rarely exceed 28 amps and the most I have ever seen is 32 amps which occurred when the batteries were heavily discharged. For convenience, we also have a remote monitor inside the house so that it is unnecessary to go outside either at night or during rainy weather. In periods of continuous sunny weather, the battery bank moves into “float mode” meaning that the controller has determined that the batteries are totally charged and the charging currents are reduced to a minimum maintenance level. Float usually occurs around 1-2 pm during a sunny day. The battery bank itself is composed of 8 x 6 volt, 200 amp-hour deep-cycle batteries, connected so that there are two series banks of 4 batteries, and these two banks are connected in parallel. This gives a working voltage of 24 volts output and a storage capacity of 9.6 Kilowatt-hours. In practice, these lead-acid batteries last between 6-8 years and require minimal maintenance apart from making sure all cabling is clean and that the electrolyte levels are always above the plate levels. A two monthly check in summer is adequate, slightly longer in winter. They are protected in a vented, wooden enclosure. To maximise battery life, the batteries are kept (where possible) in a charge-discharge cycle that usually keeps them in a charge range of 80-100 %. The inverter is now a “state of the art” sine-wave inverter capable of handling up to 2400 watts continuous load, 3700 watts for 30 minutes and surges of up to 7000 watts. This means that the system can handle any normal load from the house appliances including use of any one of the vacuum cleaner, the washing machine or the iron. This latest inverter is capable of maintaining perfect house power supplies even under the heavy loads of any of those devices and its output is far “cleaner” than the power supplies received by many homes from the electricity mains. 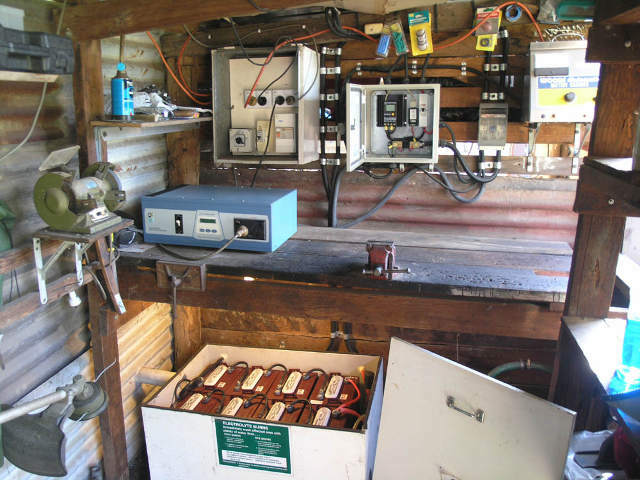 The inverter (blue box), battery bank with lid removed, current controller, main fuses and changeover switch box allowing the house to be supplied from either inverter or standby generator. For a considerable time, my original desktop computer was the only one in the house. It was upgraded as required and in about 1998, it was quite conventional and running Windows98SE as my standard system. By this time we were using a smaller powered sine-wave inverter and I had also invested in a small UPS which meant that the desktop computer could be left on as I switched from generator to inverter or vice versa. While this was extremely satisfactory, the power demands of a desktop computer can be considerable over a period of time, especially if overcast conditions prevail for several days. It may not sound much, but perhaps 50-100 watts in the monitor and another 100 watts in the desktop itself gives a load around 200 watts and it all adds up if you are working on the computer for several hours a day and at that time, the panels had not been fully upgraded to their present capacity. I did however, try to reduce power consumption by moving from a traditional monitor to an LCD monitor and this immediately dropped power usage. The situation was brought to a head, however, when my wife discovered that computers could be fun. We obtained a small desktop for her and she thoroughly enjoyed herself. We now had two desktop computers running and the load on a small system was considerable. Naturally, her monitor also became an LCD display. In 2005 we applied successfully for a grant which would allow us to have a major upgrade of the system at half price, and shortly afterwards, the current solar equipment was installed. It was at this time too that I had more or less completed the process of rejecting Windows for Linux and was only using a Windows residue in the form of Crossover Office – and that continues to the present day. However, during the upgrade period, I began to consider the option of moving wholly to laptop computers. The drop in power consumption this would produce was very compelling: instead of about 200 watts, a laptop consumes only about 20-25 watts. My desk.....the solar system monitor can be seen as a small rectangular white box with a black display panel on the wall at the upper right. The printer, scanner, laptop and VoIP system are present in order from left to right. 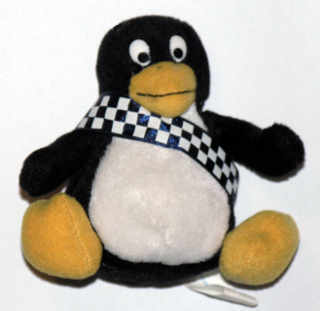 On the shelf, Tux is wearing a gift sash from the local police station – he is probably the only honorary penguin constable in Australia. 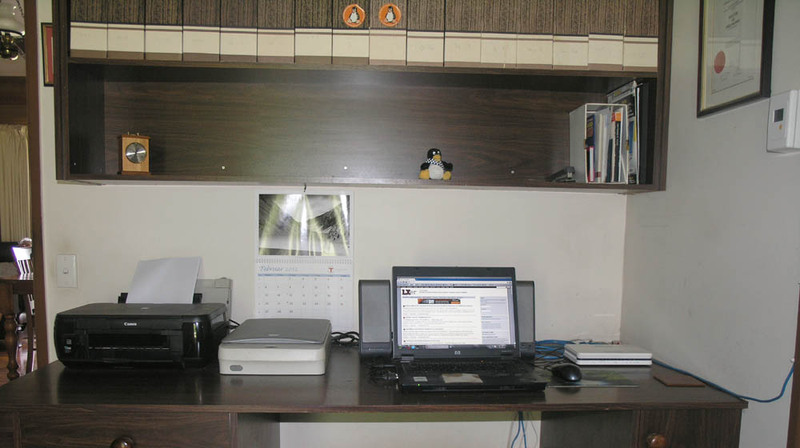 During the system upgrade in 2005, I began to consider the option of moving wholly to laptop computers. Although it would be expensive, the drop in power consumption this would produce was very compelling: instead of about 200 watts, a laptop consumes only about 20-25 watts. It would mean that either my wife or myself could run a computer for perhaps 7-8 hours straight, and still only consume the same amount of power as the desktop machine would consume in one hour. The matter was brought to a head in 2006 when I happened to see a brand new laptop on sale for a bargain price of $600. Since it had a dual core and ran at about 1.6Gig, I threw caution to the winds and purchased it........and have never looked back. Power consumption dropped dramatically and the next move was to consider my wife's computer. My solution was to find an ex-government equipment firm, and I was then able to purchase a second hand laptop for my wife, equip it with openSUSE 10.0 and use Wine to allow her to use certain software she liked. Apart from upgrading her laptop as it became increasingly antique, her system has remained more or less the same, and it is rare she doesn't use it every day. About a year later, I purchased my present HP laptop from the same firm as a brand new item and so far it has operated perfectly for four years. We now run VoIP on a broadband connection and all parts of the system function perfectly. The VoIP router permits four computers to be connected and so far these are used by my son who runs a Toshiba satellite laptop and my wife's laptop. That leaves a spare line which is only very rarely used on a second computer when I need to work with a WinXP system for university data research. Our system suits us perfectly, but I suspect that is due to the circumstances in which we originally found ourselves and the will to upgrade and maintain the system. In its current state, it almost always provides sufficient power for our needs; indeed, there is frequently a wasted surplus. For those occasions where “the sun don't shine”, the standby generator is marvellous; it's petrol engine reliability is excellent and I see it continuing in its current role for at least another 10 years. The drain by our computer needs is very small and offers minimal stress on the system. It should also be mentioned that in Australia, there has been an enormous surge in a type of solar power generation which differs considerably from ours. These “mains-solar power” installations require a mains connection to the home, without which they will not function. If these units sense a loss of mains power, they turn themselves off for safety reasons (power line workers do not want power still being supplied to the line on which they are working). The equipment consists of an array of solar panels (often two or three times as powerful as ours, but sometimes more) feeding into an inverter which then sends the generated electricity back into the power mains. There is no battery bank power storage facility which means that if a blackout occurs at either day or night, these “mains-solar powered homes” are also without power. Our system is completely separate and independent from the mains lines, stores its own power generated and produces power for the house continuously. We have seen occasions where thunderstorms have so severely damaged local mains power supplies that our home is the only residence with lights on and television running. A large number of people who have these “mains-solar systems” have panel numbers that give outputs that are five or six times as powerful as our installation. They are attracted more by the fact that they can sell their generated power back to the mains system, cancel out any cost of power consumed, and still make a profit - rather than the pleasure of using solar power for energy use reduction. Ultimately, someone has to pay, and the cost of these mains solar systems is now being carried by all the consumers who don't have one installed. And there is another problem which is becoming more evident: Australian mains power networks were designed for a single direction of power flow from a coal/gas fired power station to the home or business. These “mains-solar systems” are reversing that flow and there are already unforeseen engineering problems especially in areas with large numbers of these installations. The power lines now run down the front of our block and have been there for about 15 years. Luckily we were not caught in a local shire council plan which literally forced all the residents of a street or road where lines had not been installed, to purchase the power line installation, and so we remain wholly independent of the power companies. We know of several other solar power stand alone installations in this region that were destroyed due to this local council stupidity. One in particular was heart breaking as it virtually pauperised a person with extremely limited financial resources. It would now cost much less to have a transformer installed on the line and power connected to our house, but it is simply not worth the cost given our current circumstances. "Thankyou very much. You may certainly connect if you wish, but we are not asking you to do so, nor will we pay for such a connection." And they leave. Marvellous to be so independent, isn't it ? It struck me that the above text never indicates how much the present system would cost if I built it today. My estimate would be that to have it installed professionally would cost between $10-15,000 and that would include: batteries, panels, controller, inverter, wiring, panel supports, etc. Even so, it is a far cry from the $40-50,000 in terms of the original power line. Battery replacement is the biggest on going cost at about $2-3,000 every 6-8 years. Offsetting that, however, are current and future quarterly family/domestic power bills which are presently about $400-600 and rising. This implies a mains power bill of at least $9,600-12,800 over the same period. You must then factor in the annual cost of gas for the refrigerator (about $3,600 in total), occasional petrol for the standby generator and wood for the stove. On the whole though, I think we win easily on total power costs and the savings gap will increase in the future.